I used to always check my bag on flights, the main reason was the liquid rule with TSA. Fitting all of my haircare and skincare products (nevermind other liquids I may need) into tiny containers in a quart size bag seemed impossible. But with increased fees and fear of my bag getting lost the last few times I've flown I didn't check a bag. 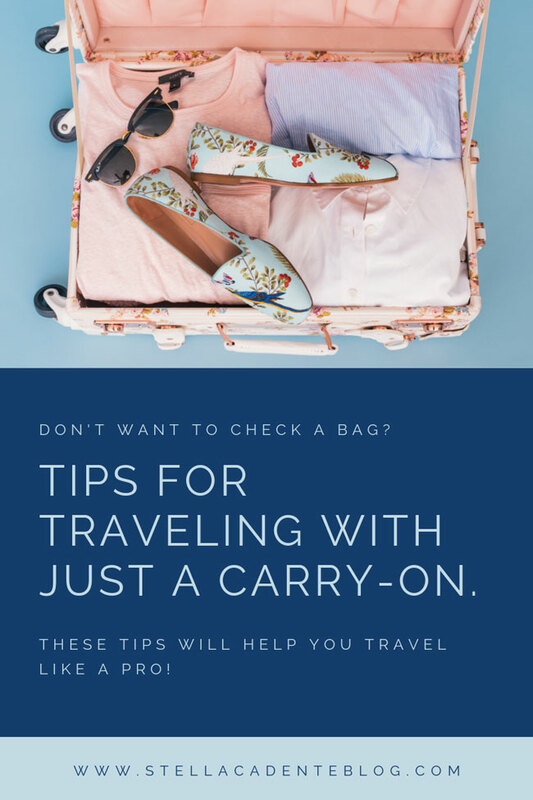 This took a little bit of research and trial and error, but now I think I've got it down so I put together a list of tips for traveling with just a carry-on. It all starts with the bag you choose. I used the same suitcase for about 20 years (no lie) and finally purchased a new one last year. I went with the small version of the Away carry-on so I knew it would always fit in the overhead and I've loved it on the trips I've taken it on. The bag is about half the weight of my other bag empty. They have a pretty wide color selection so you're sure to find something you like. While I think the light colors like white and sky blue looks really chic, I know it would drive me nuts with how beat up it's bound to get so I got navy as an alternative to black. I also got the one with the ejectable battery which has come in handy for charging my devices during long conference days when I can't find an outlet or be tethered to a wall. There are two compartments inside, one is designed for clothes and soft objects and there are straps that go over the top to help you squish those items down and one for things like toiletries and hard things like shoes. The outside of the suitcase is a hard shell but it gives a little bit so it won't crack. Another good thing about these suitcases is they're guaranteed for life and they offer a 100 day trial period. This isn't sponsored, I bought this with my own money and just really love the bag. Most airlines, depending on what kind of ticket you purchase, of course, allow you one personal item in addition to your carry-on. This can be a backpack, a purse, a diaper bag, or another small bag around the same size. Rather than carry a small purse on board, I like to use this opportunity to carry as much as I can. My favorite bag for my personal item is the Lo & Sons O.M.G. This bag can hold a lot and helps keep you organized as you travel through the airport and in-flight. The bag also slips over the handle of your suitcase so it isn't falling everywhere or killing your shoulder and it fits easily under the seat during your flight. Plus, if you're traveling for a conference this bag can double as your day bag. I get tons of compliments and questions whenever I take it somewhere. I usually pack my Henri Bendel wristlet wallet inside this bag and pack a small cross-body bag in my suitcase. I am notorious for overpacking. I like to have options with me, but the truth is I don't end up wearing or using half of the stuff that I pack. It helps to pack neutral clothing items that can be mixed with each other for a variety of looks. I love a good statement shoe, but this isn't the time to pack a pair of shoes that you'll only wear once on your trip or are hard to style. I have created something similar to a capsule wardrobe for traveling that includes things like jeans, cigarette pants, a versatile sweater, basic t-shirts, blouses, dresses, sneakers, and my most comfortable ballet flats. Sometimes I make a list of everything I absolutely need and stick to just what's on the list so I don't throw things in at the last minute thinking, "oh I might need this". You want to make the most out of the little space that you have to work with when packing. Take advantage of what would otherwise be dead space by storing things inside items like shoes, purses, and hats. Otherwise, this space is just wasted. As a bonus, it helps these items keep their shape so they don't get warped. Another way to maximize your space is by packing items that multitask. Think things like a lip product that doubles as a blush or a moisturizing oil that can be used on your hair, body, and face. For example, when I travel I only bring my straightener because I can both straighten and curl with it even if my hair has just been air dried. This saves me from packing a blow dryer, straightener, and curling wand. Look for solid or powder forms of products. Although some hotels have shampoo and conditioner in the room I like to have my own products with me that I trust and know what to expect from. You can find shampoo in a bar form from companies like Lush. This is the one that I love. My boss used it on a business trip and was so excited by it she ordered some for herself and was raving about it when we went on another trip. You can also find lotions and other personal care items that come in solid form. I tend to stick with powder foundation and blush when traveling instead of liquid or cream products to cut down on what has to go in the liquid bag. Wipes are another way to get around the liquid rule. Things like hand sanitizer and makeup remover come in wipe form that won't count toward your liquids. Free samples and travel size products are a good way to bring small amounts of products that you need. I hoard free samples and travel size free gifts from places like Sephora or Ulta for traveling, it's probably the only time I don't hate the little foil packets of product. Throwing a sample packet of conditioner that's good for 1-2 uses into your liquid bag takes up a lot less room than a travel size bottle of conditioner. For things that don't come in travel size like your mascara, I recommend investing in a travel size that will take up half the room in the bag. You can reuse the containers for a lot of travel size products when you run out by refilling them. A little tip, The Christmas Tree shop has the biggest selection of travel size products including empty containers that I've ever seen. Get creative with the containers you use. Those empty sets of TSA approved travel containers you can get at any store are usually way too big and 3 of them ends up taking up your entire liquid bag. I've had great success using contact lens holders and filling them with eye cream, serums, foundation, and products that you only need a small amount of. If you're ever unsure of something, check with TSA before you pack it. The rules are always changing and you're better to be safe than sorry. They have a Twitter account dedicated to answering questions and are usually really helpful. Let me know if you have any tips or tricks down in the comments! So glad you found this helpful Emily!